Demonstrates how to integrate digital archives and manuscripts into collection development policies and strategies, build strong relationships with creators and colleagues, appraise born-digital materials prior to an acquisition, and prepare for the challenges of collecting digital manuscripts and archives. Many libraries have archives, which serve a distinct function, albeit in a shared setting. Reconciling differences between archivists and librarians has been a long-standing issue for the information professions in the United States. Today more than ever, librarians and archivists need to understand one another and harmonize their divergent but complementary professional paths. ARCHIVES IN LIBRARIES: WHAT LIBRARIANS AND ARCHIVISTS NEED TO KNOW TO WORK TOGETHER builds a bridge toward that harmonization, suggesting ways in which archivists working in libraries can better negotiate their relationships with the institution and with their library colleagues. It also helps librarians and library directors better understand archival work by providing overviews of archival concepts, policies, and best practices. Vignettes and interviews throughout the book articulate similarities and points of departure between libraries and archives while highlighting the issues and offering solutions to practical problems. 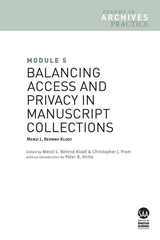 Introduces basic access and privacy laws, concepts, definitions, and professional ethical standards affecting manuscript materials and private and family papers. 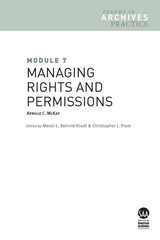 Introduces basic access and privacy laws, concepts, definitions, and professional ethical standards affecting the management of records created by organizations, businesses, agencies, and other entities. 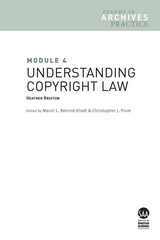 Describes the main principles of copyright law and outlines strategies for addressing common issues, special topics, and digital projects. Provides practical guidance to help archivists transfer, clear, manage, and track rights information in analog and digital archives. This open-ended series by the Society of American Archivists features brief, authoritative treatments—written and edited by top-level professionals—that fill significant gaps in archival literature. The goal of this modular approach is to build agile, user-centered resources. Modules treat discrete topics relating to the practical management of archives and manuscript collections in the digital age. Select modules are clustered together by topic (as they are here) and are available in print or electronic format. Each module also is available separately in electronic format so that readers can mix and match modules that best satisfy their needs and interests. Stay on trend with Trends in Archives Practice! 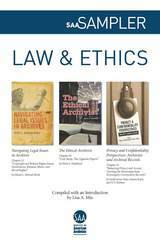 A diverse selection of thoughtful and provocative essays that explore the legal, ethical, administrative, and institutional considerations that shape archival debates concerning the administration of access to records containing personal information. Realizing Diversity and Inclusion in Archives and the Archival Profession The impulse to create archives is rooted in the very human need to leave one’s mark on the world. Whether through letters, diaries, reports, photographs, films, or a teenager’s simple need to scrawl “I was here” on a subway wall, there’s a deep desire in individuals to tell their stories, to be seen literally and figuratively in archives. With this desire also comes the need to ensure that archives are as diverse as the world we live in and to preserve the individuals and cultures that have been consciously or unconsciously underserved in the archives. 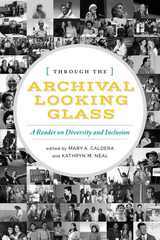 Through the Archival Looking Glass: A Reader on Diversity and Inclusion, edited by Mary A. Caldera and Kathryn M. Neal, features ten essays that explore prominent themes related to diversity, including: • Creating a diverse record • Recruiting diversity to the profession and retaining a diverse workforce • Questioning the archive itself, on representation, authority, neutrality, objectivity, and power Through the Archival Looking Glass illustrates a multitude of perspectives and issues so that fresh voices can emerge alongside more familiar ones, and new concepts can be examined with new treatments of established ideas. Diversity is an ever-evolving concept; the term itself is increasingly rephrased as inclusion. By stimulating further ideas and conversation, we can come closer to a common understanding of what diversity and inclusion are or can be and, perhaps most importantly, how they may be realized in archives and the archival profession. Offers readers an analytical guide and example assignments for teaching with primary materials, based heavily on first-hand case study accounts and interviews with practitioners and experts in the field. Moving Image and Sound Collections for Archivists by Anthony Cocciolo is for every archivist (or archivist in training) who has unearthed some carrier of moving image and sound and wondered what to do. 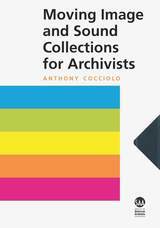 Combining best practices with guidance for specific media formats, Cocciolo applies concepts of appraisal, description, and accessioning to audiovisual collections, providing a solid grounding for archivists in environments where resources for description, digitization, and storage are scarce. TRENDS IN ARCHIVES PRACTICE, a new, open-ended series of modules by the Society of American Archivists, features authoritative treatments written and edited by top-level professionals that fill significant gaps in archival literature. 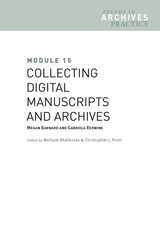 Module 2 in the series, PROCESSING DIGITAL RECORDS AND MANUSCRIPTS, builds on familiar terminology and models to show how any repository can take practical steps to process born-digital materials and to make them accessible to users. TRENDS IN ARCHIVES PRACTICE includes two other modules: STANDARDS FOR ARCHIVAL DESCRIPTION and DESIGNING DESCRIPTIVE AND ACCESS SYSTEMS. Each module can be purchased separately, or you can purchase the bundle, ARCHIVAL ARRANGEMENT AND DESCRIPTION, which features all three modules. 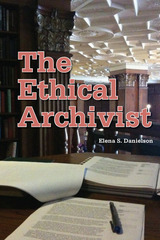 Archivists deal with unique ethical challenges on a regular basis, and these complex conundrums are the focus of this compelling book by Elena Danielson. She illustrates how the daily decisions made by archivists connect to larger issues of social responsibility and the need to construct a balanced and accurate historic record. Danielson both analyzes real-life cases and poses theoretical questions to help working archivists better understand ethics as an applied practice. The author clearly illustrates how ethical considerations and dilemmas emerge in seemingly routine facets of archival work-from acquisition and appraisal through disposition and deaccessioning. Danielson also focuses on such fascinating phenomena as forged documents and displaced archives. She thoughtfully considers the archivist's responsibility to protect cultural property, and includes commentary on current trends in privacy law, clearly explaining relevant legislation. Helpful appendices include an analysis and reference to ten professional codes of ethics, sample acquisition guidelines and collections management policies, a select list of federal legislation affecting access to private information, and a bibliography. Presents digital preservation best practices and standards for developing policies, procedures, and infrastructure to accession born-digital materials. The digital age has spurred constant technological and sociocultural change. In Conceptualizing 21st-Century Archives, author Anne J. Gilliland explores the shifts and divergences in archival discourse that technological developments have necessitated, facilitated, or inspired. Gilliland addresses the lessons the archival and recordkeeping fields can learn from their evolution about ideas tried and abandoned; which ideas are truly new, and which continue to hold good, regardless of technological shifts; and the ways in which archivists need to expand their thinking and practices to fulfill their global and local “glocal”—roles. By understanding how archival practices and thinking were challenged or how archivists responded at different points over the past century, the reader can begin to discern how and why ideas rise, fall, and resurge. The book traces the development of descriptive systems, the creation and management of computer-generated records, and the curation of digital materials. 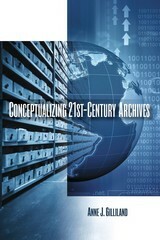 With each chapter, Gilliland addresses either the historical development or the current state of an area within archival science that information and communications technology have significantly affected to ultimately construct a picture of how archives arrived in the 21st century and to suggest where they might be going in the foreseeable future. 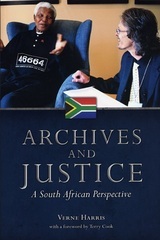 ARCHIVES AND JUSTICE: A SOUTH AFRICAN PERSPECTIVE is collection of Verne Harris's best writing during the first decade of South Africa's post-apartheid democracy. Harris is the project director of the Nelson Mandela Centre of Memory in Johannesburg. While South Africa is his immediate context, Harris always engages wider geographical and conceptual worlds. The volume is organized into five sections. "Discourses" illuminates Harris's engagement with writings and discussions related to archives. "Narratives," the second section, "explores the stories that archivists tell in certain domains of professional work-appraisal, electronic recordmaking, and arrangement and description." The third and fourth sections, "Politics and Ethics" and "Pasts and Secrets," recount and reflect on events and issues with which Harris has wrestled as a South African archivist. The op-eds contained in the final section, "Actualities," provide evidence of Harris's "deliberate endeavors to bring awareness of archive to popular debates in South Africa." Drawing on the energies of Derridean deconstruction, Harris suggests an ethics, and a politics, expressed in the maxim "memory for justice." And he portrays the work of archives as a work of critical importance to the building of democracy. 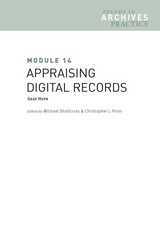 Provides practical tools and resources for conducting and documenting an appraisal of digital records. 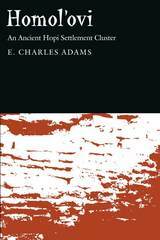 Twenty-eight essays represent significant recent American writings on archives and the role of archivists in modern society. These articles provide important perspectives both on basic elements of archival practice and on fundamental principles in archival theory and methodology. 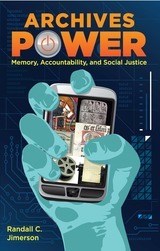 Grounded in historical and social theory, this analysis of the power of archives and the role of archivists in society calls for renewed emphasis on remembrance, evidence, and documentation as a means of securing open government, accountability, diversity, and social justice, within an archival ethics of professional and societal responsibility. In EXHIBITS IN ARCHIVES AND SPECIAL COLLECTIONS LIBRARIES, longtime special collections exhibits curator Jessica Lacher-Feldman advises archivists at all levels on developing enlightening and entertaining exhibits. She describes each step of the exhibit process, providing straightforward tips on: Developing innovative exhibit ideas Formulating exhibit policies and procedures for your institution Crafting well-written and visually interesting exhibit labels Branding and designing exhibits Promoting exhibits through conventional media, social media, and give-away items Also included are case studies that detail exhibits at a variety of institutions, sample documents and forms, a literature review, and a guide to exhibit supplies. Exhibit development doesn't have to be complicated or overwhelming. With this comprehensive resource, you'll learn how to develop exhibits that help you to better connect with your audience and advocate for your repository. "Proceed and be bold" with exhibit development, and gratifying, inspiring results will transpire. When it comes to personal collections, we live in exciting times. Individuals are living their lives in ways that are increasingly mediated by digital technologies — digital photos and video footage, music, the social web, e-mail,and other day-to-day interactions. Although this mediation presents many technical challenges for long-term preservation, it also provides unprecedented opportunities for documenting the lives of individuals. Ten authors — Robert Capra, Adrian Cunningham, Tom Hyry, Leslie Johnston, Christopher (Cal) Lee, Sue McKemmish, Cathy Marshall, Rachel Onuf, Kristina Spurgin, and Susan Thomas — share their expertise on the various aspects of the management of digital information in I, Digital: Personal Collections in the Digital Era. 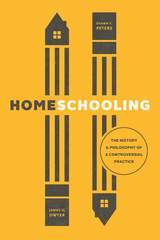 Part 1 is devoted to conceptual foundations and motivations. Part 2 focuses on particular types, genres, and forms of personal traces; areas of further study; and new opportunities for appraisal and collection. Part 3 addresses strategies and practices of professionals who work in memory institutions. 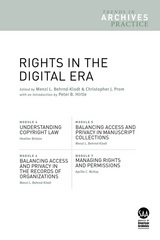 Chapters explore issues,challenges, and opportunities in the management of personal digital collections, focusing primarily on born-digital materials generated and kept by individuals. Contributions to I, Digital represent the depth in thinking about how cultural institutions can grapple with new forms of documentation, and how individuals manage--and could better manage--digital information that is part of contemporary life. Digital records pose many challenges for archives, libraries, and museums; and behind them all lurks the shadow of trust. How can donors know that your repository will take good care of their digital files? How can people verify that the records they wish to use are authentic? How can they have confidence in being able to access obsolete file formats far into the future? These are difficult questions, but whatever the size or mission of your archives, you can move it closer to answering them and to being a trusted digital repository. 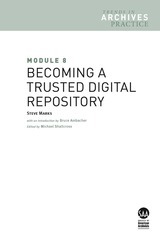 Meeting the gold standard—ISO 16363 Audit and Certification of Trustworthy Digital Repositories—may seem like a far-off goal, but Module 8: Becoming a Trusted Digital Repository demystifies this complex standard. Module 8 demonstrates specific ways that your archives, library, or museum can identify gaps, improve digital operations, and plan for future enhancements so that you can indeed help it become a trusted digital repository. The SAA Sampler Series features collections of select chapters from authoritative books on archives published by the Society of American Archivists. Produced exclusively electronically, the samplers are designed to give readers an overview of a pertinent topic as well as a taste of the full publications. In this volume you'll discover three outstanding pieces on legal and ethical issues for archivists--one overview of copyright and two case studies dealing with privacy and access--drawn from three books published by the Society of American Archivists: NAVIGATING LEGAL ISSUES IN ARCHIVES, THE ETHICAL ARCHIVIST, and PRIVACY AND CONFIDENTIALITY PERSPECTIVES: ARCHIVISTS AND ARCHIVAL RECORDS. Provides practical guidance to archivists, librarians,and educators on teaching with archival materials,offering tips for beginners as well as seasoned instructors. Leads archivists through the provisions of Describing Archives: A Content Standard (DACS) with the aim of assisting institutions in choosing between available options and creating documentation for local application. 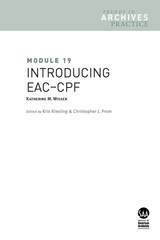 Includes extended examples of recording DACS content in EAD3, EAC-CPF, and MARC formats. 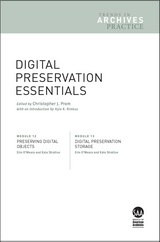 Explores concepts of digital preservation in the archival context, focusing on standards and metadata required to make digital objects accessible and understandable over time. Provides an introduction to digital storage best practices for long-term preservation, including terminology, hardware, and configurations. The SAA Sampler Series features collections of select chapters from authoritative books on archives published by the Society of American Archivists. Produced exclusively electronically, the samplers are designed to give readers an overview of a pertinent topic as well as a taste of the full publications. 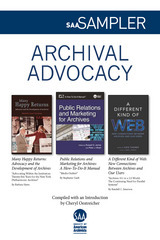 In this volume you'll discover three outstanding pieces on archival advocacy drawn from books published by the Society of American Archivists: MANY HAPPY RETURNS: ADVOCACY AND THE DEVELOPMENT OF ARCHIVES; PUBLIC RELATIONS AND MARKETING FOR ARCHIVES; and A DIFFERENT KIND OF WEB: NEW CONNECTIONS BETWEEN ARCHIVES AND OUR USERS. As diverse and rich as the American demographic is in their contents, the personal papers of members of Congress have tremendous and often untapped historic value in documenting each members district or state and its relationship to the federal government. Yet congressional collections challenge archivists and collecting institutions with every conceivable management problem associated with twentieth- and twenty-first-century records. From soliciting the collection and working with the member's office through detailed processing guidelines to planning effective outreach activities, each chapter of this manual includes the best practices for managing these unwieldy collections. A project of the Congressional Papers Roundtable of the Society of American Archivists and funded by a grant from the National Historical Publications and Records Commission, Managing Congressional Collections serves the needs of administrators and archivists who work with these specialized collections. Trends in Archives Practice by the Society of American Archivists is a new, open-ended series of modules featuring brief, authoritative treatments — written and edited by top-level professionals — that fill significant gaps in archival literature. The goal of this modular approach is to build agile, user-centered resources. Each module will treat a discrete topic relating to the practical management of archives and manuscript collections in the digital age. The first three modules address archival arrangement and description and are designed to complement Kathleen D. Roe's book, ARRANGING AND DESCRIBING ARCHIVES AND MANUSCRIPTS. They include: MODULE 1 STANDARDS FOR ARCHIVAL DESCRIPTION Sibyl Schaefer and Janet M. Bunde Untangles the history of standards development and provides an overview of descriptive standards that an archives might wish to use. MODULE 2 PROCESSING DIGITAL RECORDS AND MANUSCRIPTS J. Gordon Daines III Builds on familiar terminology and models to show how any repository can take practical steps to process born-digital materials and to make them accessible to users. MODULE 3 DESIGNING DESCRIPTIVE AND ACCESS SYSTEMS Daniel A. Santamaria Implementation advice regarding the wide range of tools and software that support specific needs in arranging, describing, and providing access to analog and digital archival materials. Teaching With Primary Sources is part of the series Trends in Archives Practice. 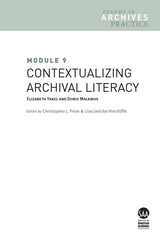 It includes three modules: Module 9: Contextualizing Archival Literacy by Elizabeth Yakel and Doris Malkmus Examines the evolving theory of archival literacy in relation to domain knowledge, primary source literacy, and information literacy to facilitate meaningful use of archival and manuscript collections. 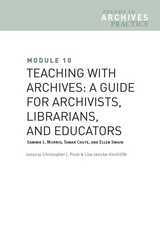 Module 10: Teaching With Archives: A Guide for Archivists, Librarians, and Educators by Sammie L. Morris, Tamar Chute, and Ellen Swain Provides practical guidance to archivists, librarians,and educators on teaching with archival materials,offering tips for beginners as well as seasoned instructors. 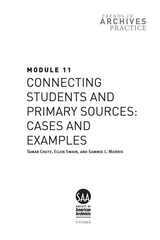 Module 11: Connecting Students and Primary Sources: Cases and Examples by Tamar Chute, Ellen Swain, and Sammie L. Morris Offers readers an analytical guide and example assignments for teaching with primary materials, based heavily on first-hand case study accounts and interviews with practitioners and experts in the field. 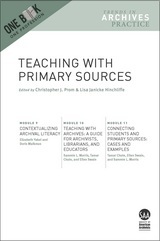 As Lisa Janicke Hinchliffe notes in the introduction, "These three modules present a wealth of resources for meeting the challenges of primary source literacy instruction. They can be read start-to-finish to build a foundation for practice. Or, they can be dipped into as needed by the busy educator who needs practical ideas or inspiration for that next instruction session." 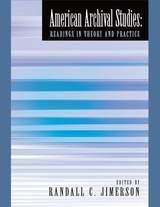 Putting Descriptive Standards to Work, edited by Kris Kiesling and Christopher J. Prom, is the most recent addition to SAA’s Trends in Archives Practice series. 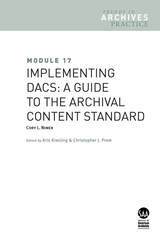 The book consists of four modules: Module 17: Implementing DACS: A Guide to the Archival Content Standard by Cory L. Nimer, lead archivists through the provisions of Describing Archives: A Content Standard (DACS); Module 18: Using EAD3, by Kelcy Shepherd, introduces Encoded Archival Description Version EAD3; Module 19: Introducing EAC-CPF by Katherine M. Wisser, introduces Encoded Archival Context–Corporate Bodies, Persons, and Families (EAC-CPF); and Module 20: Sharing Archival Metadata, by Aaron Rubinstein, explores strategies for sharing archival metadata with researchers in the digital humanities and other archivists. Digital Preservation Essentials is part of the series Trends in Archives Practice. 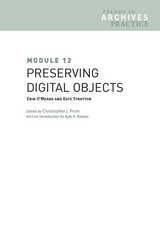 It includes two modules by Erin O'Meara and Kate Stratton: Module 12: Preserving Digital Objects Explores concepts of digital preservation in the archival context, focusing on standards and metadata required to make digital objects accessible and understandable over time. 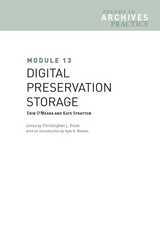 Module 13: Digital Preservation Storage Provides an introduction to digital storage best practices for long-term preservation, including terminology, hardware, and configurations. 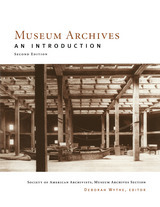 As University of Illinois Preservation Librarian Kyle R. Rimkus notes in the introduction, "The successful archivist needs a grounding in the fundamental concepts of digital preservation, a command of its key terminology and practices, and an ability to build effective programs and practices. These modules provide an excellent point of entry." 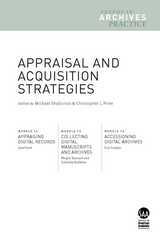 Appraisal and Acquisition Strategies is another installment in the series Trends in Archives Practice and consists of the following three modules: Module 14: Appraising Digital Records by Geof Huth; Module 15: Collecting Digital Manuscripts and Archives by Megan Barnard and Gabriela Redwine; and Module 16: Accessioning Digital Archives by Erin Faulder. As Michael Shallcross of the Bentley Historical Library notes in the introduction, "an essential point in each module is the continuity of practice between the acquisition of traditional materials and digital content. 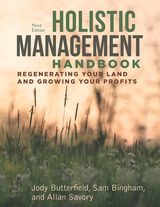 The differences lie in the skills, knowledge, and tools required to identify potential preservation and access issues." These modules cover that and more. Kathleen Roe's guide to arranging and describing archival materials provides both practical advice and critical context, creating an important resource for archivists in all walks of their professional lives. The arrangement and description of archival materials has so changed since Fredric M. Miller's 1990 edition of ARRANGING AND DESCRIBING ARCHIVES AND MANUSCRIPTS that it may nearly seem a new practice. Kathleen Roe's thorough and readable revision, however, shows that this critical function of archival work is truly one based on core principles that still hold today. Roe has intermingled the theory and context in which collections are arranged and described with clear and practical instructions on the process, resulting in a work that is richer than an instruction manual, yet equally valuable. The chapter on "The Context of Arrangement and Description" provides a clear discussion of the origins of the practice in Europe and the United States, and moves into an historical overview of developing standards that archivists of all levels will appreciate for its clarity. The lengthy chapter on "The Practice of Arrangement and Description" is complemented by appendices that offer sample scenarios, arrangement patterns, and finding aids. Together, these provide a sturdy foundation for students or novice archivists seeking to hone their processing skills. Just as the importance of arrangement and description to the archivist cannot be overstated, neither can the significance of this text in describing that process. Roe's work will introduce new archivists to the practice as well as refresh the sensibilities of seasoned professionals for years to come. Explores the potential of data created by archivists and, using approaches and tools for sharing structured data, how it can be shared with researchers in the digital humanities as well as how it can enhance archivists own discovery systems and strategies. TRENDS IN ARCHIVES PRACTICE, a new, open-ended series of modules by the Society of American Archivists, features authoritative treatments written and edited by top-level professionals that fill significant gaps in archival literature. Module 3 in the series, DESIGNING DESCRIPTIVE AND ACCESS SYSTEMS, provides implementation advice regarding the wide range of tools and software that support specific needs in arranging, describing,and providing access to analog and digital archival materials. TRENDS IN ARCHIVES PRACTICE includes two other modules: STANDARDS FOR ARCHIVAL DESCRIPTION and PROCESSING DIGITAL RECORDS AND MANUSCRIPTS. Each module can be purchased separately, or you can purchase the bundle, ARCHIVAL ARRANGEMENT AND DESCRIPTION, which features all three modules. TRENDS IN ARCHIVES PRACTICE, a new, open-ended series of modules by the Society of American Archivists, features authoritative treatments written and edited by top-level professionals that fill significant gaps in archival literature. 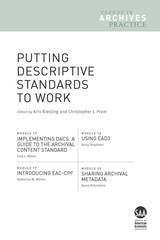 Module 1 in the series, STANDARDS FOR ARCHIVAL DESCRIPTION, untangles the history of standards development and provides an overview of descriptive standards that an archives might wish to use. TRENDS IN ARCHIVES PRACTICE includes two other modules: PROCESSING DIGITAL RECORDS AND MANUSCRIPTS and DESIGNING DESCRIPTIVE AND ACCESS SYSTEMS. Each module can be purchased separately, or you can purchase the bundle, ARCHIVAL ARRANGEMENT AND DESCRIPTION, which features all three modules. 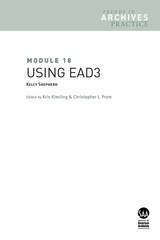 Provides an introduction to Encoded Archival Description Version EAD3, including its benefits and challenges, overall structure, and relationship to other archival standards. Discusses changes in the recent version and offers practical information on implementation. Introduces the standard Encoded Archival Context—Corporate Bodies, Persons and Families (EAC-CPF) and situates it in the wider archival standards landscape. Examines the evolving theory of archival literacy in relation to domain knowledge, primary sourceliteracy, and information literacy to facilitate meaningful use of archival and manuscript collections. The Past, Present, and Future of Women’s Archives Women’s archives hold a significant place in the historical record, illuminating stories of individuals who had an impact on our past in both powerful and quiet ways. The history of the archives themselves—and the struggle to achieve equal representation within the historical record—also tell a valuable story, one that deftly examines American culture and society over the past few centuries. 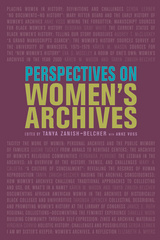 In PERSPECTIVES ON WOMEN'S ARCHIVES, eighteen essays written by noted archivists and historians illustrate the origins of a women-centered history, the urgent need to locate records that highlight the diverse experiences of women, and the effort to document women’s experiences. 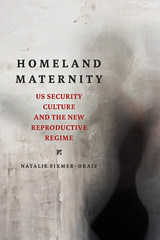 The essays also expose the need for renewed collaboration between archivists and historians, the challenges related to the accessibility of women’s collections, and the development of community archives. Ultimately, archival relevancy is reinforced, not diminished, by sharing resources and exposing absences. PERSPECTIVES ON WOMEN'S ARCHIVES inspires new thinking about the value of women’s archives and how to fill the gaps in our recordkeeping to move toward a more diverse and inclusive future.